Calling all school/college students aged 7-19! Make a 1-minute animated film on your computer, enter our competition, and you could win great prizes! You can enter as an individual, or as a team of up to 4 people. Prizes are awarded by age category (KS2, KS3, KS4 and KS5). Use any software you like (e.g, Scratch, Flash, Blender, Maya, Max, etc). File formats accepted: sb, sb2, mov, mp4, avi, swf. (Here are the FAQ and Rules). Deadline for entering: 31 March 2017. Prizewinners will be announced in May 2017. Animations on the theme of keeping safe online can win prizes in a special eSafety category sponsored by BCS, The Chartered Institute for IT. Teachers – register your School now (with no obligation to enter) and we’ll send you some snazzy A2 colour Animation17 posters! Schools can get Maya and 3DSMax for free in Autodesk’s Design The Future scheme. And registered schools can get a free 4-week trial of Zu3D Animation Software! Just email Zu3D to claim your free trial. 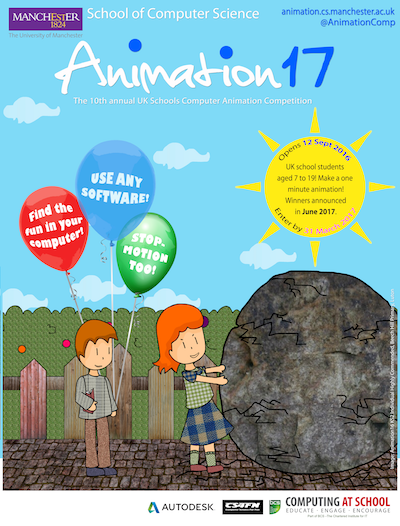 Last year’s competition, Animation16, received almost 1,000 entries from 1,378 students from 130 schools across the UK. The Awards Ceremony was on 12 July at the National Media Museum and you can see all the amazing winners on YouTube!